On Saturday 14th August Former British & European Super Middleweight Champion James Cook, along with many local boxers and boxing & TV personalities will be taking part in a Charity 20/20 Cricket match, at Beckley Park Cricket Ground, Rectory Lane, Beckley, to raise funds for Tenterden Amateur Boxing Club, Pedro Amateur Boxing Club and Beckley Park Cricket Club. Amongst the well known boxers Joining James Cook are British Light Middleweight Champion Sam Webb, former British & Commonwealth Super Bantamweight Champion Michael Alldis, Former British Champion and World Title challenger Ali Forbes, former British Light Middleweight champion Gary Woolcombe and former British title challenger Derek Grainger. Also from the world of boxing top coaches Johnny Eames and Alan Smith and referees John Lewis and Geoff Hines will also be taking to the pitch. The boxers team will also include Eastenders star Sylvester Williams. 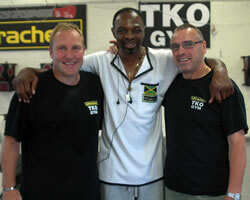 Speaking at his world famous Ultrachem TKO Gym, in Canning Town, esteemed champion coach Johnny Eames said, “Obviously after our fundraising event, on behalf of the Indee Rose Trust, it’s nice to show our support to James and be involved in his charity event to raise money for such a good cause. The Boxers versus Beckley Cricket Club Charity 20/20 Cricket match is on Saturday 14th August at Beckley Park Cricket Ground, Rectory Lane, Beckley.